I have another date for your diary for those of you who either live in Jersey or who may be going there for a holiday next month. Barbara Kendall-Davies, who is a member of the Jersey Dolls House Club, has asked if I can spread the word to you all about the club's latest exhibition. Their room box theme this year is a scene from a story and amongst exhibits will be scenes in box files, member's dolls' houses, shops, etc.. 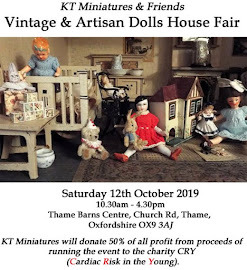 There will also be refreshments, a sales table, a quiz and a raffle. The painting above was created by Barbara herself with acrylics on canvas, and it is a scene of boats in Gorey Harbour - Jersey. Good luck to the Jersey Club....hope you all have a fantastic day...sounds like fun! 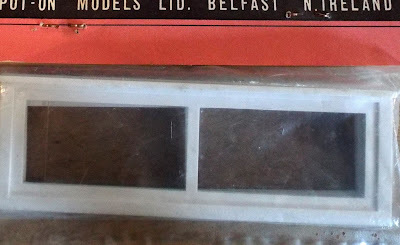 If you received my KT Miniatures Newsletter yesterday, you will have seen that I had just put up for sale two extremely rare c1960s Tri-ang Spot-On packaged windows. Ok....they may be just plastic....but it is BECAUSE they were plastic and consequently rather fragile, that makes these windows so sought after and rare, as frustratingly so many got broken by their young owners. 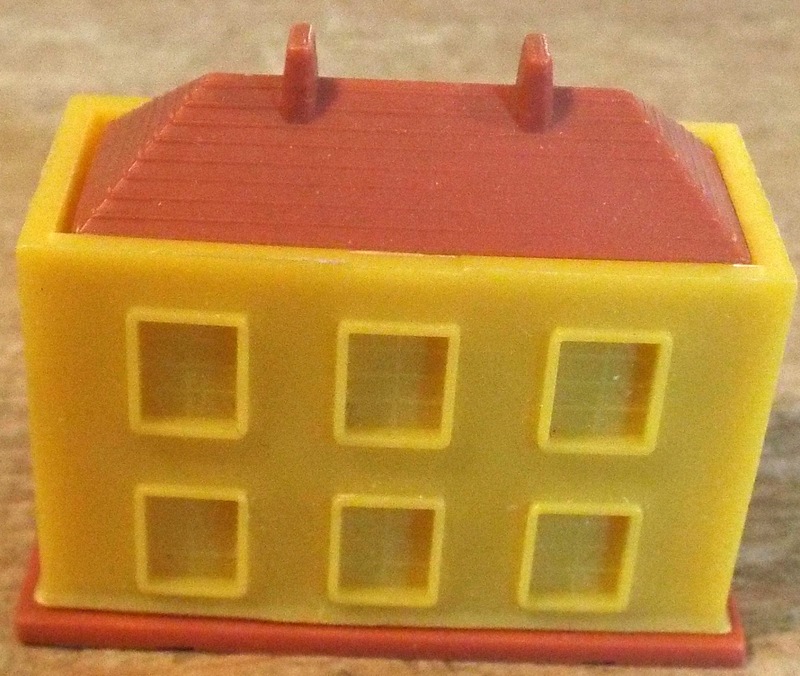 There must be many collectors out there who have vintage Tri-ang dolls houses with the original plastic windows that are either missing or instead have broken plastic windows stuck in place with Cellotape! 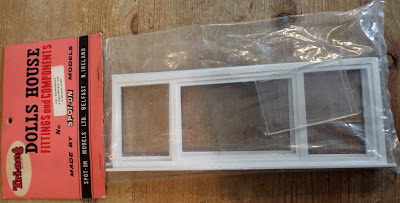 This is the larger of the two windows....on the packet the label states it as being "No. 1151 Contemporary 3 Light Window With 2 Opening Lights." Inside the packet there are two white frames which presumably click together either side of the wall and the tiny lugs slot into the relevant holes. There are also three clear plastic pieces of glazing....two that are obviously meant to be the opening windows and the other is for a central fixed window. 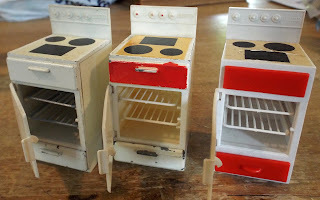 These belonged to Marion Osborne and are featured on page 207 in her The Book Of Tri-ang Furniture For The Dolls House. 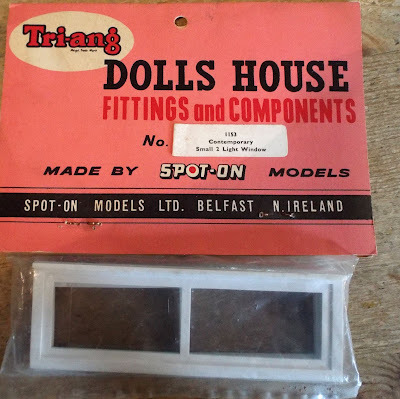 Marion tells us that this particular window could be found in the Tri-ang "V" and "U" dolls house, so if you have this model house and are in need of a replacement window, here is a rare opportunity to obtain a new one unused. This is the second window that is available to purchase. It is much smaller and slimmer but has the same concept of two frames clicking together via lugs. 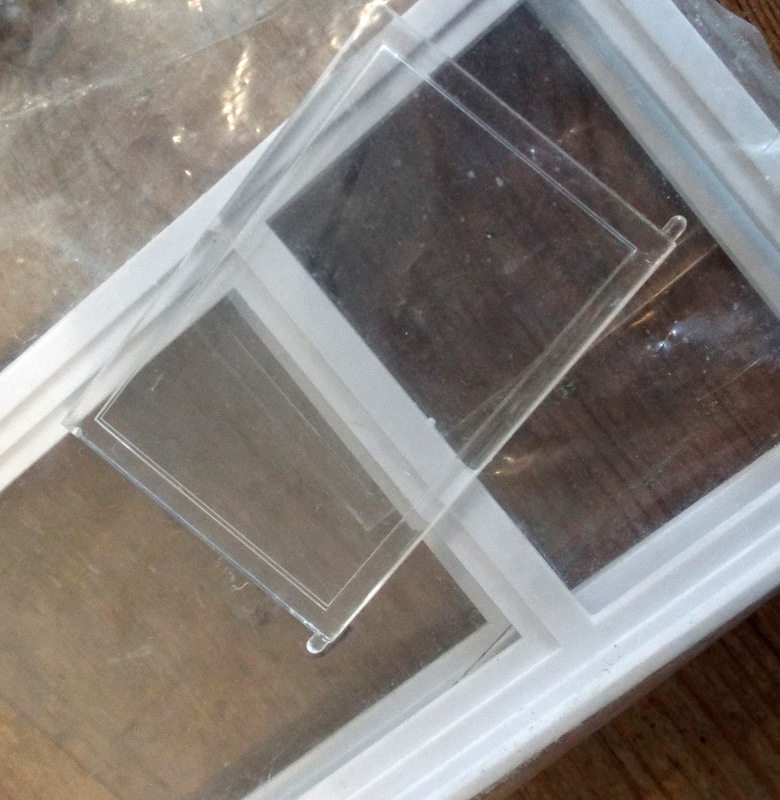 There is just one long piece of clear plastic for the glazing. On the label it describes this as "No.1153 Contemporary Small 2 Light Window". 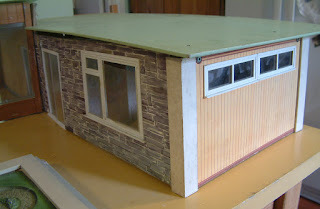 Marion tells us in her book that this is suitable for an "A" or "C" Tri-ang Bungalow. 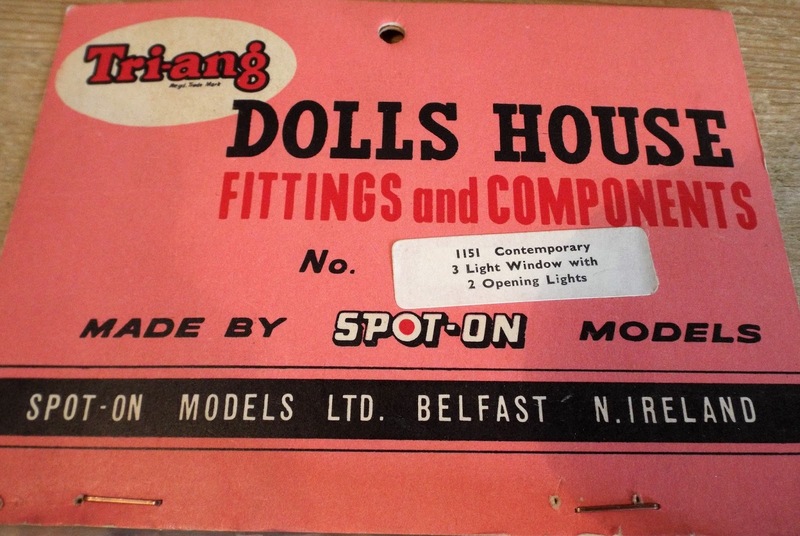 Marion also tells us in her book that these windows were sold loose by retailers so some people used these Tri-ang plastic windows in homemade dolls houses too. In this Tri-ang Bungalow "C" that was sold by KT Miniatures several years ago now, you can see the No. 1153 Contemporary Small Window in situ, on the right front wall. In this close up photo, you can see that there were two of those smaller windows fixed side by side. 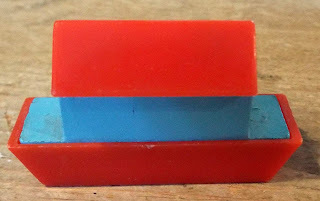 During the next few days, I hope to do more listing of Tri-ang including several Tri-ang Jennys Home rooms. They will be listed all together on their own page, directly linked to the above Tri-ang page.....so watch this space for more news about these shortly! Just Look What Came Through The Post!! I have just had a lovely and very unexpected surprise in the post.....an envelope filled with these beautifully illustrated postcards! 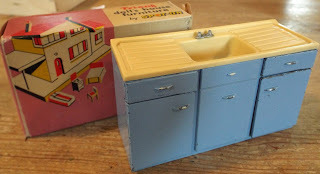 If you are a lover of 1940s dolls houses, you will like Rachel's other blog too - 1940s Terrace DollsHouse where Rachel shows us her first dolls house project. 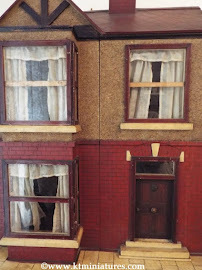 As the blog title suggests....it is a Victorian terraced dolls house set in the 1940s. 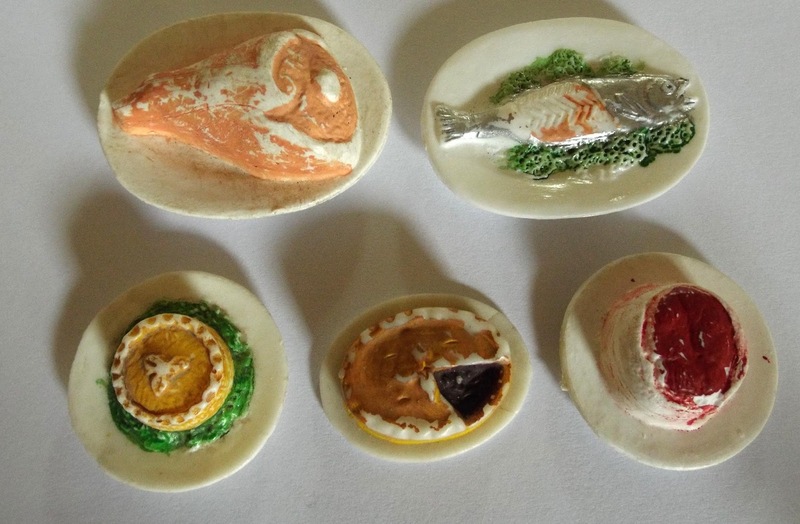 She has some very clever ideas! Had to dash off for a few days....but back now. Apologies for the delay in replying to emails and phone messages for most of last week and over the weekend.....unfortunately I had to dash off for a few days but thankfully am back now. 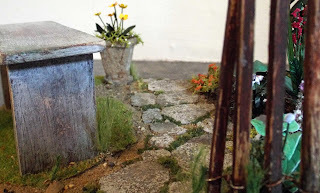 I have finally managed to work through the backlog of emails and phone messages, now hopefully fingers crossed, KT Miniatures can get back to normal. Many thanks for your patience. Oh Dear...Now Mollie Is In Disgrace! Over the years, my two kitties have got themselves into some right old scrapes. But my gorgeous 6 year old black and white rescue kitty called Mollie has well and truly excelled herself this time! There I was last week, on the hottest day of the year here in the UK....grabbing a few minutes respite from final preparations for the Cheltenham workshop....when I heard someone knocking rather enthusiastically on my front door! 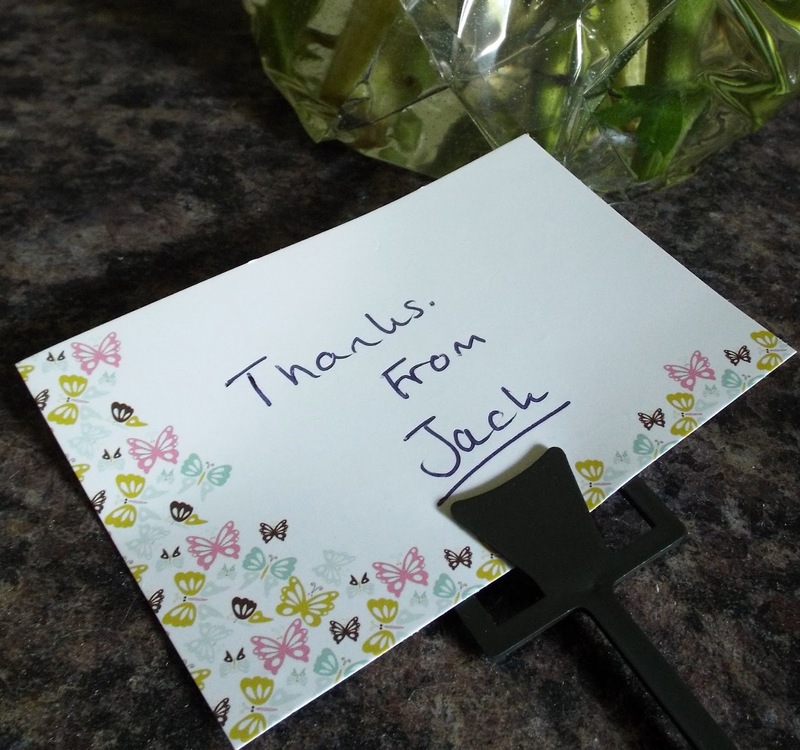 I opened to find my elderly neighbour Jack, very red faced and a little bewildered...mumbling something on the lines that he hopes I have got good cat insurance and it was too hard to explain, I had better come and take a look instead! Hmmm....sensing I was not going to like what he was about to show me, I braced myself well and truly. We didn't have to go far....just to his front lounge window!! 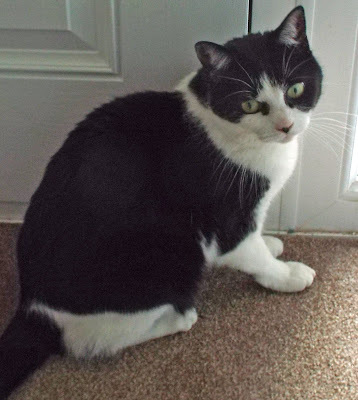 Well...the story goes that naughty Mollie, who is by nature a very friendly and nosey cat, decided to trot through my neighbour's open patio doors and make herself at home in his lounge whilst he was elsewhere in the house. 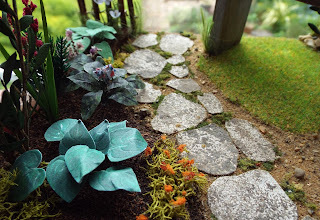 Finally, when Jack emerged downstairs and walked into his lounge, Mollie decided to make a quick exit out of the nearest open front window...only what she didn't bank on was that there were lace curtains in the way. In her blind panic, she completely shredded his curtains down one side, as well as making a massive hole so that she could jump right through and out of the window!!! Well what else could I do....I had to apologise profusely, dig out my tape measure and measure up his rather large window (93" wide no less) and embark on ordering him a new curtain. So much for my few minutes respite! Finally, after much trawling on the internet of all the main UK stores...I ended up going with a specialist net curtain company, who were actually very reasonable and a replacement came very quickly. So today, we had the official hanging of Jack's new net curtain. 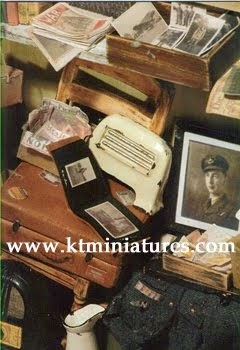 He reckoned that it looked much better than the old tatty one...ha ha, I had to agree! It was nice to see him smiling again and he seemed very pleased indeed. 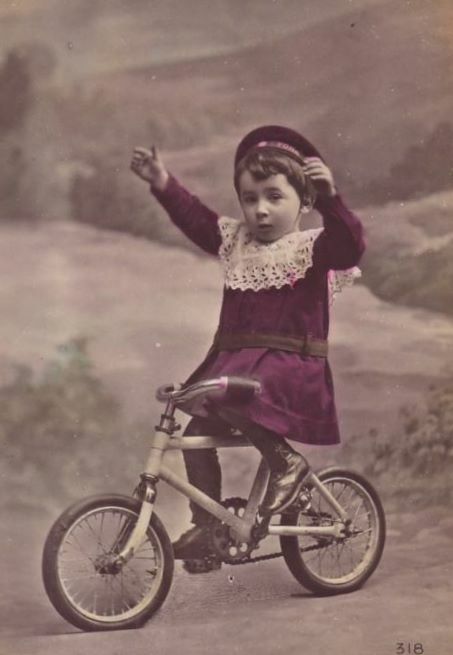 "all's well that ends well"! 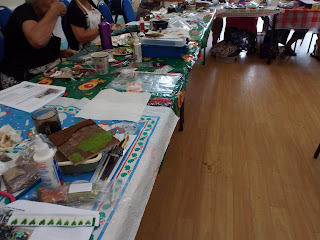 I must start this posting by extending a huge THANK YOU to all the ladies and gent who gave such a warm welcome at the Cheltenham Miniaturists Club last Thursday morning, to both my Nostalgia In Miniature Workshops' colleague Robin Britton and myself. They weren't just members of the Cheltenham Club but some had come from the Forest Of Dean, Gloucester and Swindon Clubs too! 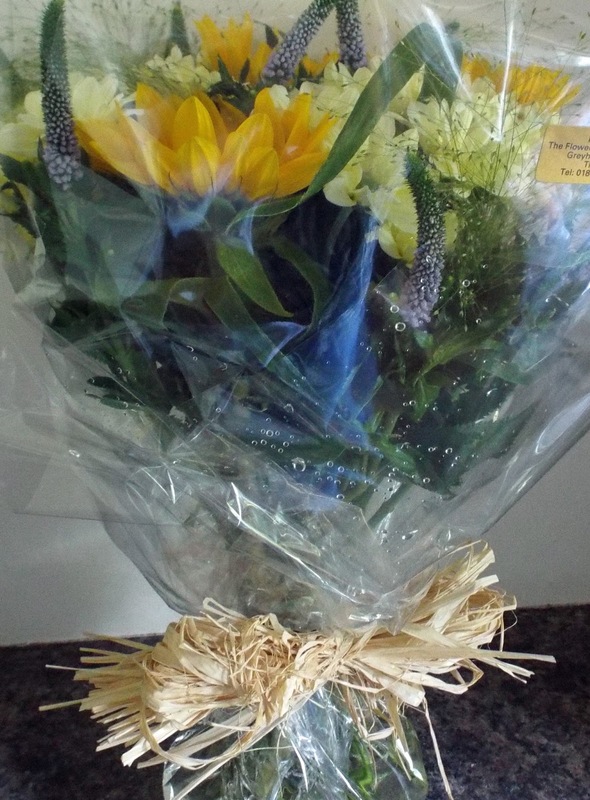 It was just so nice to be immediately greeted with offers of coffee, cake and help with unloading the car, after a long journey on a hot morning! And the morning just got better, as all attending were so enthusiastic, very talented and attentive. 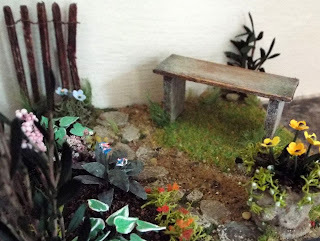 This project incorporated several techniques including aging wood with acrylic paints, and creating simple fencing & path using ordinary household materials. 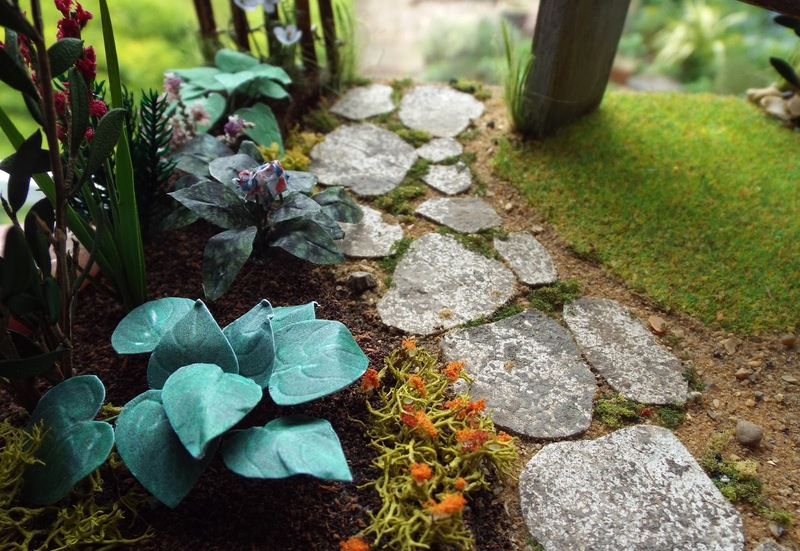 There were some very smiley faces by the end of the morning....with some rather lovely miniature gardens floating out the door! Both Robin and I agreed that this had been a real pleasure of a workshop to undertake. We hope very much that we are invited back again next year!! At long last, I have been able to emerge from workshop kit making and get down to some serious listing of vintage dolls house items. 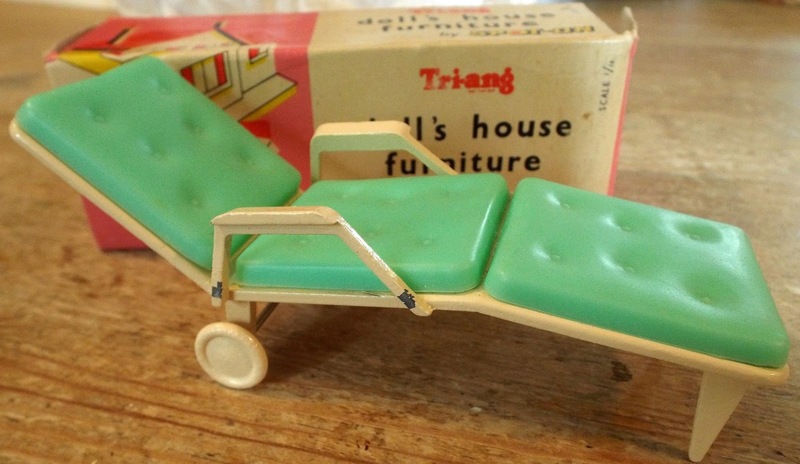 For the moment, I am concentrating on vintage c1960s Tri-ang dolls house furniture and accessories, all of which belonged to Marion Osborne, who collected a variety of pieces for research purposes whilst writing The Book Of Tri-ang Furniture. 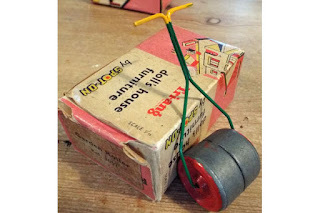 With the book written, Marion no longer has need for all these pieces and I have a few boxes of bits and bobs still remaining, to sell on her behalf. 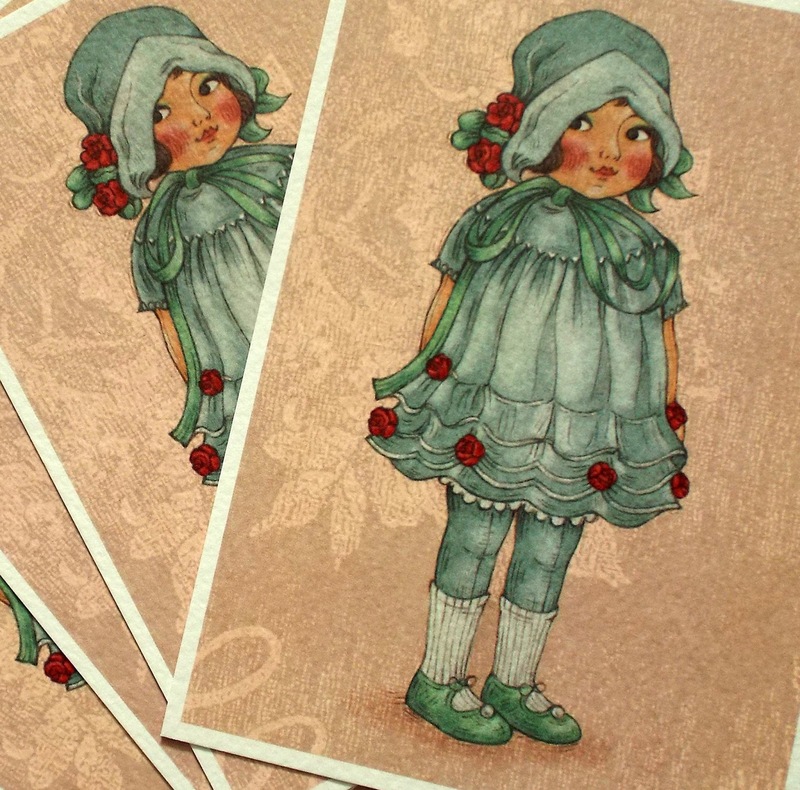 Some of the more rare pieces were sold a while ago but I still have quite a bit more to go. 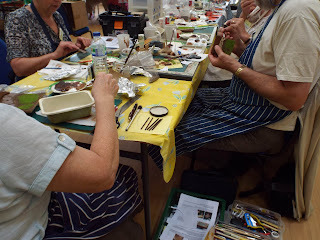 Am having great fun rummaging through all the boxes once again - trouble is I keep getting side tracked as I marvel at many of the pieces!! 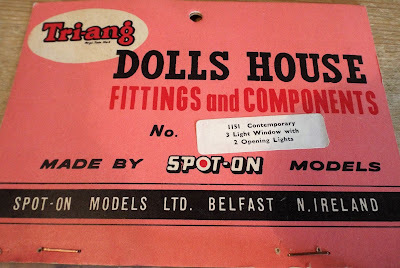 In my childhood during the early 1960s, I was lucky enough to have a beautiful dolls house made for me by my grandfather, and can remember that Tri-ang dolls house furniture was quite expensive in comparison to Barton, Kleeware etc. at that time. Consequently, as a child the only Tri-ang dolls house furniture I owned was the Spot-On bathroom suite....I thought I had died and gone to heaven when my grandparents actually bought me that set!! 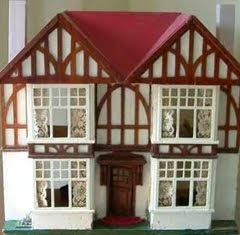 There is no doubt that there is something rather lovely about these 1/16th scale Tri-ang dolls house pieces. 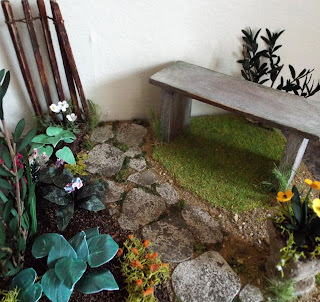 But for now...I will begin with the garden area. 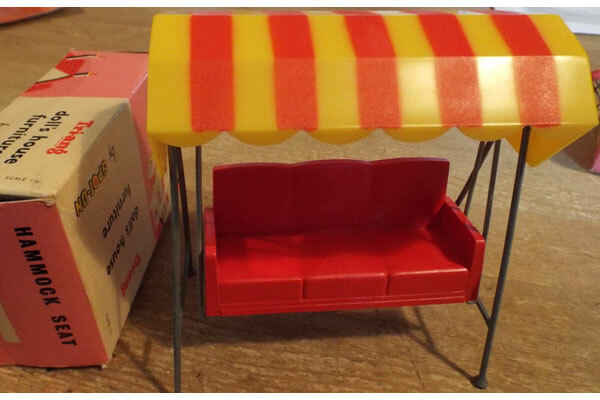 Amongst the six different coloured sun loungers now listed is this unplayed with boxed green lounger...in wonderful condition. The frame is cream painted metal and the fixed cushions are this pretty green plastic. Is refreshing to have the box too. This is a complete boxed Hammock Seat and when put together, consists of a swinging hammock seat under a striking yellow and red canopy. There is this rare heavy metal boxed Spot-On garden roller. 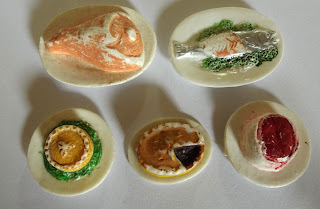 As well as complete food sets, I have listed a whole array of singular foods which can be bought separately. 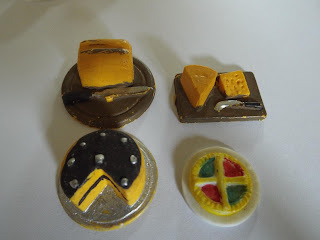 My favourite is that chocolate cake...looks almost good enough to eat! There are various sinks including this heavy metal and plastic boxed blue Spot-On sink. 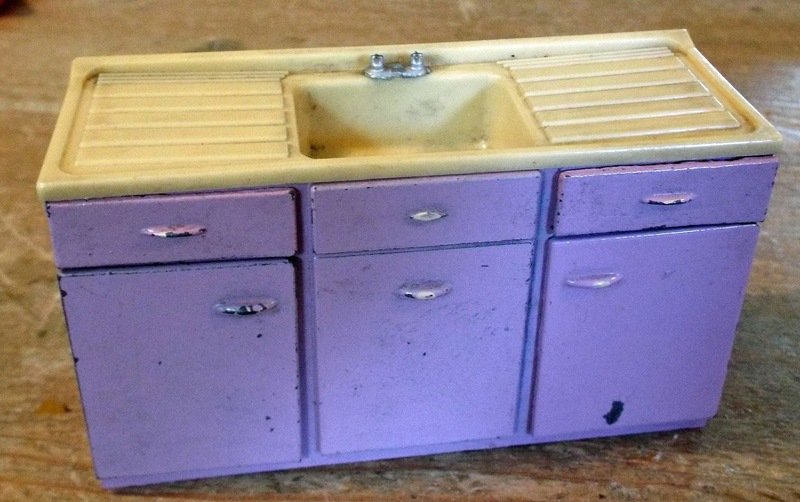 And this gorgeous lilac coloured heavy metal and plastic Spot-On sink. 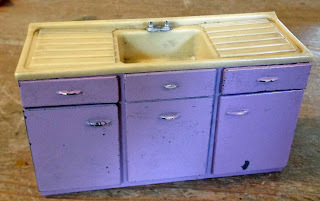 So too there various plastic and plastic/metal Jennys Home sinks. 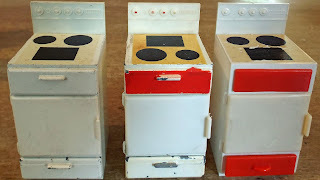 Plus there are various cookers, including the all plastic Jennys Home version. 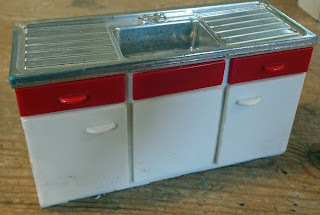 I will be listing various kitchen tables, chairs, washing machine, fridges plus tiny bits and bobs including washing up bowls and broom cupboard tools etc. 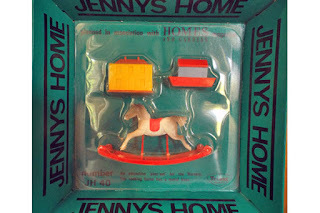 from both the earlier Spot-On range, as well as the later Jennys Home range. 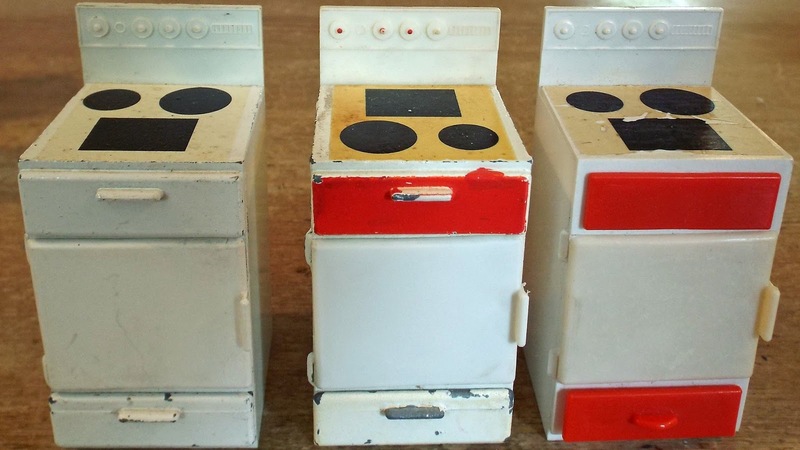 You can purchase various toys singularly such as the above toy dolls house for the nursery. Or you can purchase a whole boxed set of both the little house, ark and rocking horse. I have umpteen playpens, cots, baby baths, prams, etc. to put up for sale within this category. Still to be listed are more living and dining room furniture and accessories...plus more bedroom, bathroom, etc. Watch out too for a number of Tri-ang Jennys versatile plastic rooms to be listed this coming week plus some rare window components.